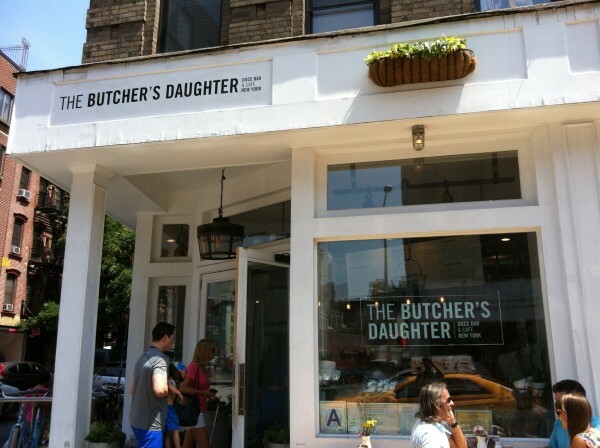 One of our first stops in New York was The Butcher’s Daughter. Known for its ability to serve simple, delicious and wholesome food, the restaurant has a wonderful way of changing the way the people think about the way vegan food looks and tastes. We stepped into the shop and fell immediately in love with the entire look of the place. Bleached-white walls contrast with bright pops of green produce hanging artfully on carefully placed meat hooks and the perpetual flow of colorful fruit and vegetable juices coming out of the bar provide a running rainbow motif. Interestingly enough, the bar itself is fashioned from a butcher’s block, showing off “the dichotomy of a masculine butcher shop with very feminine vegetarian fare”, as the owner, Heather Tierney states. Tierney (Apotheke, Pulqueria) runs the shop with Brandi Kowalski (ABC Kitchen) and Joya Carlton (Buvette). Creating dishes like beet tartare and characuterie boards featuring a roasted-veggie terrine, mushroom-walnut paté and cashew ricotta, they’ve turned staple bistro items into a brand new experience. 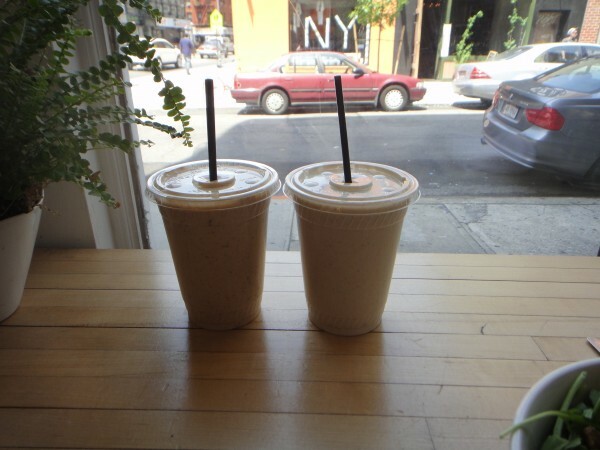 We started with a couple of smoothies – one Brass Monkey made with frozen banana, peanut butter, honey and almond butter and the other, Heaven on Earth blended with young Thai coconut, dates and almond butter. Both lived up to the online hype about the drinks here. Just thick, creamy, and delicious. Next time though, we’re going for the juices. Everything on the juice menu just sounds amazing… I mean, I don’t know how we passed up Water Flower (watermelon, honeydew, cactus pear, fennel, lime, lavender), The Goddess of Green (kale, cucumber, green apple, fennel, pineapple, thyme, and blue green algae) or even By Way of Morocco (tangerine, saffron, lime). There will be a next time. We both picked the smashed avocado benedict as our first choice – that being said, there was no way we weren’t geting it. 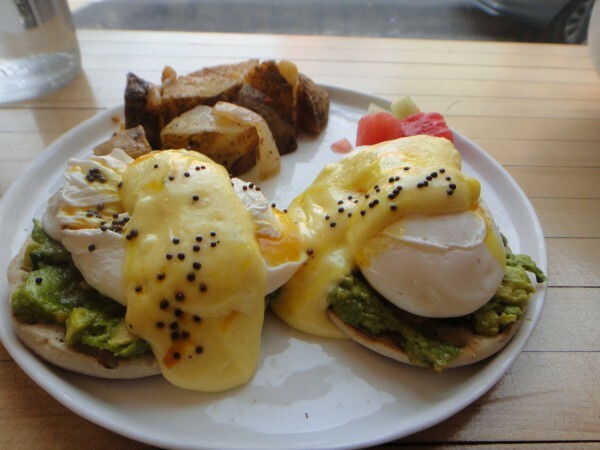 Two beautiful poached eggs sat atop slices of whole-grain English muffins smeared with smashed avocado while curried hollandaise, mustard seed and lime garnished the top. Then, roasted potato hash was served on the side. Glorious. 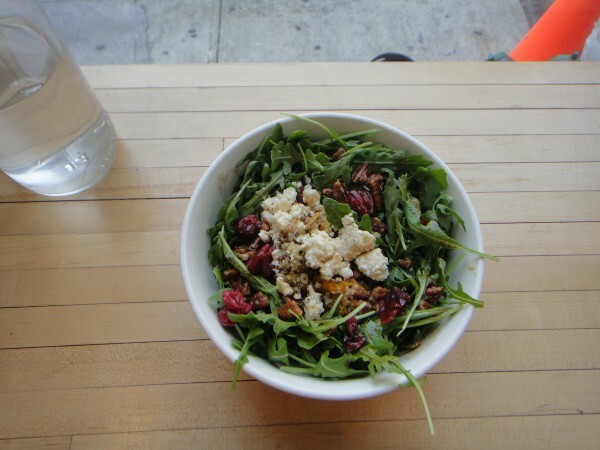 The salad was comprised of bunches of arugula tossed with black and white quinoa, butternut squash, candied pecans, sour cherries, and almond feta all dressed with a balsamic-maple vinaigrette. The feta was the most interesting part of the dish for me – the consistency was pretty much spot on, plus a hint of almond made every bite that much more memorable. The Butcher’s Daughter effectively gives vegan food a new face, giving it a definite stylish upgrade. In order to avoid the lunch time crowds, sneak in early morning or before the dinner rush. Yes, eating here will set you back a couple of bills, but in the end, it’s worth it. If you’re still in doubt, a sip of one of those juices (any of them) will change your mind. I can almost guarantee it. Tags: avocado, benedict, Brunch, Healthy, Lunch, New York, New York City, Organic, Raw, Smoothies, Toast, Vegan, Vegetarian.